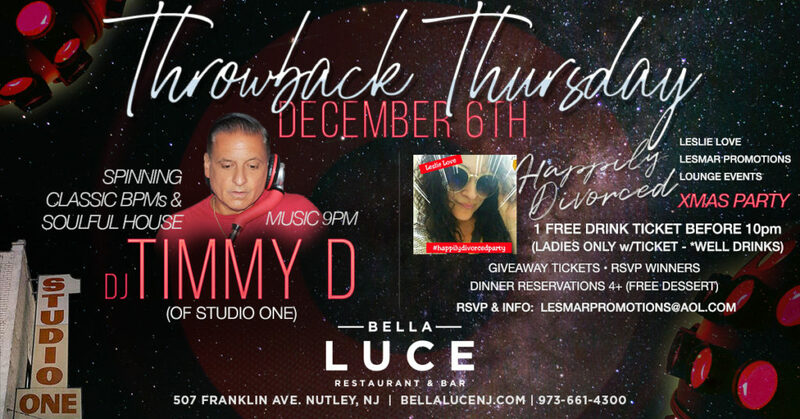 DJ Timmy ‘D’, past DJ at some of the area’s hottest nightclubs including Joey’s (Clifton), Studio One (Newark), Parrilos (Belleville), and Butterfields is back with ‘Throwback Thursday’ at Bella Luce on Thursday, December 6th, 2018. Don’t miss a great night out as Timmy spins the hottest classic BPMs and soulful house. Music starts 9pm. Also, LesMar promotions presents the Happily Divorced XMAS Party. Don’t miss Giveaways, Prizes, and more. RSVP to lesmarpromotions@aol.com for more info OR DM them on Facebook. Large groups welcome, dinner reservation recommended! If you haven’t tried one of Chef Erm Firmani’s amazing dishes, make your dinner reservations today!